Seniors that choose to spend their golden years in assisted living in South Carolina will love the beautiful beaches that are in close proximity to culturally-packed historical cities. Apart from that, the tax system in The Palmetto State is very senior friendly. If high temperatures are an issue for you, the climate in South Carolina is mild, providing comfort throughout the whole year. Are you interested to find out more about the assisted living costs, facilities and benefits that are available for seniors that either reside or are considering to retire to South Carolina? Look no further! In this article, we have collected all the important information that you will need so as to make an easier decision in the end. This information includes the senior living options and assisted living, as well as the various types of support systems and amenities that each of them have to offer. If you already have a general idea about where in this state you’d like to retire to, feel free to use the list of cities that we have provided below. With a housing index of 92.60, South Carolina is considered to have a lower average cost of living when compared to the national average. One-bedroom apartments in South Carolina have an average monthly cost of $634, compared to the national average of $825 per month. Two-bedroom apartments go for an average monthly cost of $767, compared to the national average of $1027 per month. Seniors in need of a supervised facility where they can socialize with their peers during daytime can take a look at the many adult daycare facilities in South Carolina. This way, their primary caregivers can tend to their own obligations. The average monthly cost for a stay in one of these facilities is about $1,192. This type of care is best suited for seniors that are mostly independent and don’t need 24/7 care. South Carolina is also a home to assisted living facilities that provide seniors with assistance with their daily tasks. This type of senior care has an average cost of about $2,865 per month and gives seniors access to personal care and health services. Last but not least, nursing homes exist in South Carolina, and they have ‘round the clock supervision and caring about seniors that are unable to lead an independent life and don’t have a caregiver that would help them with their daily tasks. Semi-private rooms have an average monthly cost of $6,418, while rooms with more privacy go for about $6,844 per month. Seniors at these facilities are provided assistance with personal care, medications, housing, ‘round the clock supervision and skilled nursing care, as well as therapies and rehabilitation when needed. If you’re interested in retirement in South Carolina and want to find out more about the reasons people choose this state for retirement, take a look below, where we have listed and elaborated some of the perks to living in this state. The Hilton Head Island Bike Trails is another beautiful site to visit and is considered as “biker’s paradise.” The bike trails are isolated from roadways and provide a safe and comfortable environment for everyone that wants to get their exercise. When you take a look at South Carolina’s tax system, it is very senior friendly since it offers retirees plenty of tax breaks. South Carolina is known for having some of the lowest property taxes in the U.S., and in addition to that, it doesn’t have taxes on Social Security retirement benefits. Seniors that have some other forms of retirement income will have a $15,000 deduction. After you passing, your benefactors won’t have to worry since there is no inheritance or estate taxes in this state as well. When put in comparison with other states, South Carolina has a rather reasonable cost of living. The median home value in this state is $148,000, compared to the national median home value of $206,300. In addition to cheaper housing, citizens in South Carolina have access to more affordable goods and services as well. According to each individual’s personal and health needs, various senior living options exist in South Carolina: independent living, assisted living, memory care, and nursing homecare. Read below to find out more about each of these. South Carolina has over 180 independent living facilities scattered all over the state. This type of living is best suited for seniors that are still healthy and active, without the need of ‘round the clock nursing care. The average monthly cost for independent living facilities in this state can range from as low as $511 to as high as $3,250. The area with most affordable independent living facilities is the Florence area, while the most expensive facilities are located in the Hilton Head Island-Bluffton-Beaufort metropolitan areas. Seniors that like apartment style living have various apartment communities for people aged 55+ and 65+, and these communities usually have many amenities which include gyms, walking and hiking trails, pools and jacuzzies, and meeting rooms, to name a few. Over 330 assisted living facilities are available all over South Carolina, and their purpose is providing seniors with professional caregivers, healthcare, as well as access to social and local activities. Residents of these facilities can get help with housekeeping, laundry services, transport, meal preparation, and ‘round the clock working staff that ensures their safety. The services provided by assisted living facilities in South Carolina have an average monthly cost ranging from $930 to $5,910. As it is with independent living facilities, assisted living facilities cost more the closer they are to metropolitan areas, while the more affordable facilities can be found in the suburban and rural areas. South Carolina has 160 memory care centers which specialize with care for seniors suffering from Alzheimer’s and other memory loss ailments. Memory care centers work with seniors towards reducing the stress brought upon by memory loss with the help of an experienced staff that helps seniors when they get lost, or with daily tasks like personal care and medications. These centers have an average annual cost of $50,003. The most expensive memory care centers are located in the Hilton Head Island area for an average annual cost of $73,260, while the more affordable centers can be found in the Florence area for the average cost of $35,383 per year. South Carolina is very dedicated when handling its aging population by creating building communities specialized in senior lifestyles and needs, often keeping seniors and families close by each other. Seniors that require a higher level of care can pick and choose from over 630 senior living providers in the state. Adult daycare centers provide seniors with three daily meals, as well as help with personal care, exercises, and similar while their primary caregivers can tend to their own daily obligations. The most expensive adult daycare centers can be found in the Hilton Head Island metropolitan area for the average annual cost of $20,280, while the most affordable centers are located in Spartanburg for the incredibly low annual cost of $12,350 – way below the national average annual cost of $23,280. Hospice care specializes with seniors that have been diagnosed with terminal illness. This type of senior care provides terminally ill seniors with everything they need in order to peacefully spend their final days with the help of professionally trained staff which administers medication to ease the physical pain and suffering which is brought upon their illness. Seniors can also get chaplain services for their spiritual needs, as well as grief counseling for themselves and their family. South Carolina has 165 hospices, and their costs are usually covered by Medicaid, Medicare, and personal insurances. Respite care facilities can really help seniors and their primary caregivers, especially when they are a part of the family. Looking after a disabled senior can be very taxing, both mentally and physically. Because of that, primary caregivers often need some time off in order to recuperate and take care of their other responsibilities while their elders are being cared for in one of these facilities. Respite care facilities have an average annual cost of $67,525 – which is cheaper than the national average. This doesn’t mean that there aren’t any expensive ones, as some centers’ monthly costs can get as high as $11,130. Assisted-living-facilities.net will help you to find the best quality Assisted Living facilities in South Carolina. You can also find skilled nursing, memory care facilities, retirement communities and assisted living regulations in South Carolina. Here you can compare ratings and check prices and costs for assisted living. Read reviews and more, with the best directory for Assisted Living Facilities. The state of South Carolina has 485 assisted living facilities. If you're searching for information about assisted living communities in South Carolina, you need to look no further! Assisted-living-facilities.net will provide you with the most comprehensive information about the number of 485 assisted living facilities for seniors that are currently available in South Carolina. The assisted living services available in South Carolina include in-home residential and assisted living situations, nursing homes, retirement communities, adult day care, and a range of independent living situations, you can also find Alzheimer's and hospice care. Searching in Assisted-living-facilities.net to find information about South Carolina's assisted living communities is simple! You can use the site in these ways to search and find the assisted living facility or community that is the right one for your needs, and allows you or to your loved one, to live close to friends and family and to enjoy fully. Getting all the support of the amenities that South Carolina has to offer. 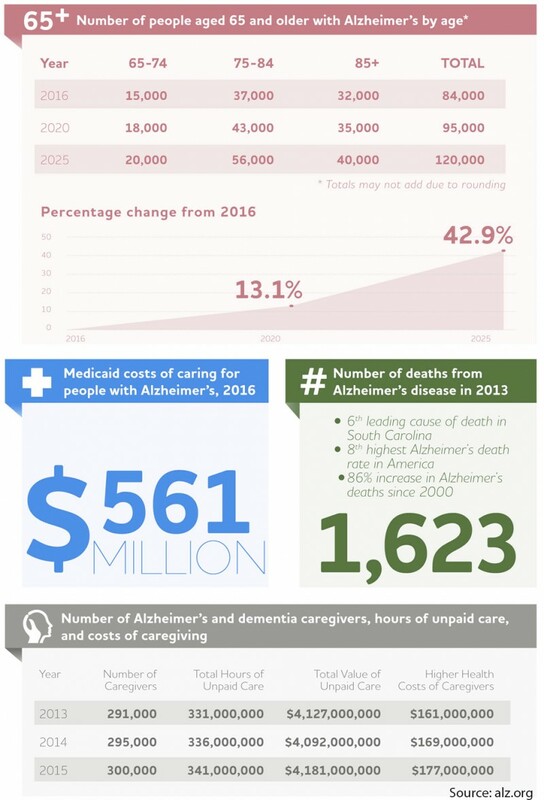 The average monthly starting costs for assisted living facilities in South Carolina (higher for residents requiring memory care) starts and depends on the level of care the resident. The average monthly cost of assisted living in South Carolina starts from $1,800 to $4,900.